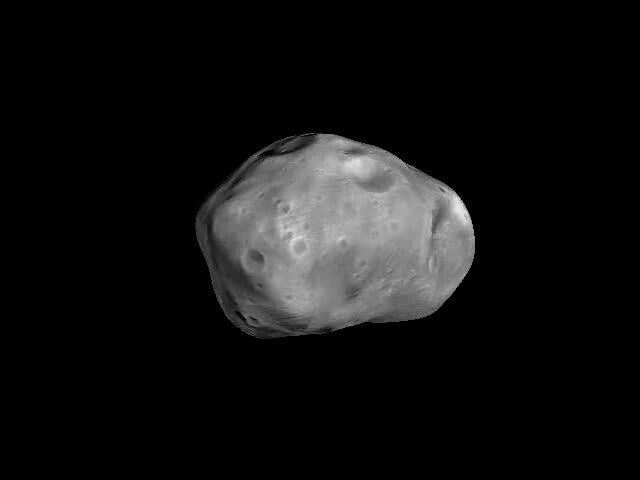 (PhysOrg.com) -- Today Mars Express began a series of flybys of Phobos, the largest moon of Mars. The campaign will reach its crescendo on 3 March, when the spacecraft will set a new record for the closest pass to Phobos, skimming the surface at just 50 km. The data collected could help untangle the origin of this mysterious moon. The latest Phobos flyby campaign began today at 06:52 CET (05:52 UT), when Mars Express drew to within 991 km of Phobos’ airless surface. The flybys will continue at varying altitudes until 26 March when Phobos moves out of range. They offer prime chances for doing additional science with Mars Express, a spacecraft that was designed to study the red planet below rather than the grey moon alongside. “Because Mars Express is in an elliptical and polar orbit with a maximum distance from Mars of about 10 000 km, we regularly pass Phobos. This represents an excellent opportunity to perform extra science,” says Olivier Witasse, Mars Express Project Scientist. 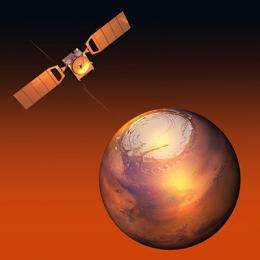 Back in 2009, the mission team decided that the orbit of Mars Express needed to be adjusted to prevent the closest approach of the spacecraft drifting onto the planet’s nightside. The flight control team at the European Space Operations Centre in Darmstadt, Germany, presented a number of possible scenarios, including one that would take the spacecraft to just 50 km above Phobos. “That was the closest they would let us fly to Phobos,” says Witasse. Heavy emphasis is being placed upon the closest flyby because it is an unprecedented opportunity to map Phobos’ gravity field. At that range, Mars Express should feel differences in the pull from Phobos depending which part of the moon is closest at the time. This will allow scientists to infer the moon’s internal structure. Previous Mars Express flybys have already provided the most accurate mass yet for Phobos, and the High Resolution Stereo Camera (HRSC) has provided the volume. When calculating the density, this gives a surprising figure because it seems that parts of Phobos may be hollow. The science team aim to verify this preliminary conclusion. In particular, the MARSIS radar will operate in a special sequence to try to see inside the moon, looking for structures or some clue to the internal composition. “If we know more about how Phobos is built, we might know more about how it formed,” says Witasse. The origin of Phobos is a mystery. Three scenarios are possible. The first is that the moon is a captured asteroid. The second is that it formed in situ as Mars formed below it. The third is that Phobos formed later than Mars, out of debris flung into Martian orbit when a large meteorite struck the red planet. All the instruments will be used during the campaign, including HRSC. Although no imaging will be possible during the first five flybys, including the closest one, because Mars Express approaches from the nightside, high-resolution pictures will be possible from 7 March onwards. One task for HRSC is to image the proposed landing sites for the Russian mission Phobos-Grunt. "Although no imaging will be possible during the first five flybys, including the closest one"
"...it seems that parts of Phobos may be hollow. " They've never heard of the Hollow Phobos hypothesis?